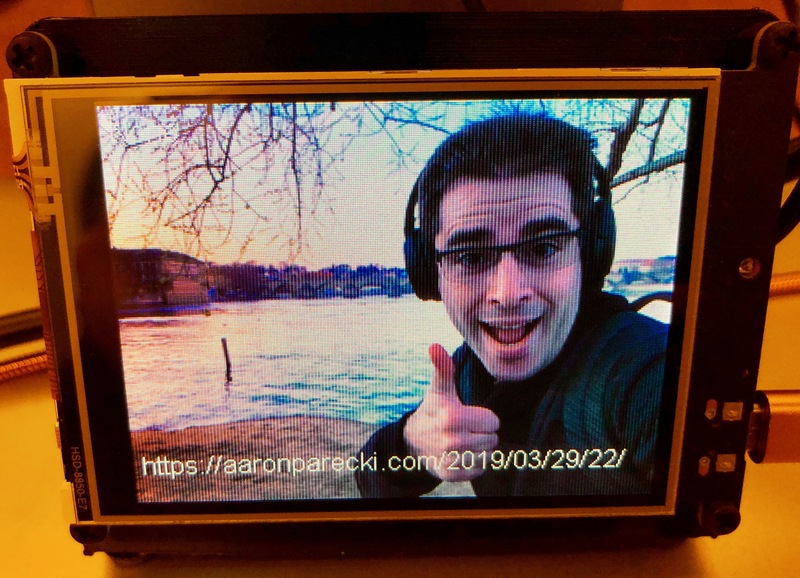 Loving the Adafruit PyPortal as an IndieWeb-powered photo device. Ekster now supports actual Indieauth to the Microsub channels. It's now possible for example to connect with indiepaper.io and "archive" pages to a channel. But of course the possibilities are endless. Ohh this is exciting! Congrats https://eddiehinkle.com! This article was originally posted on the GoDaddy blog. I have a new home on the internet. I don’t visit the Twitter home timeline or the Facebook news feed anymore. I don’t open the Instagram app except when I post a photo. I still have accounts there — I just don’t visit those sites anymore. Instead, I have my own new space on the internet where everything I’m interested in is consolidated, and I can read and reply to things from there. But before I go too far into my new online home — an IndieWeb reader — some background. It used to be the case that when you opened Twitter, you’d see every tweet from everyone you’re following, in order, with the newest at the top. Over the past few years, Facebook, Twitter, Instagram and many other services have switched to what’s known as an “algorithmic timeline,” meaning posts no longer show up in chronological order. Instead, these services use proprietary algorithms to decide what to show you and when. They now decide what content is more important for you to see, and even interject ads into your timelines. We clearly need a way to take back control of what we’re reading online. You might remember RSS readers did a pretty good job of giving individuals control of what they are subscribed to. However, over the years, Twitter, Instagram and many other social media platforms have shown us that people enjoy reading and sharing short-form content, not just blog posts. Twitter not only provides an easy way to post content online, it also provides a single place to read what everyone else has posted. More importantly, these sites also enable you to quickly respond to the things you’re following. Whether that’s clicking the heart icon to show your support of a post, or writing a reply to something as you’re reading it. 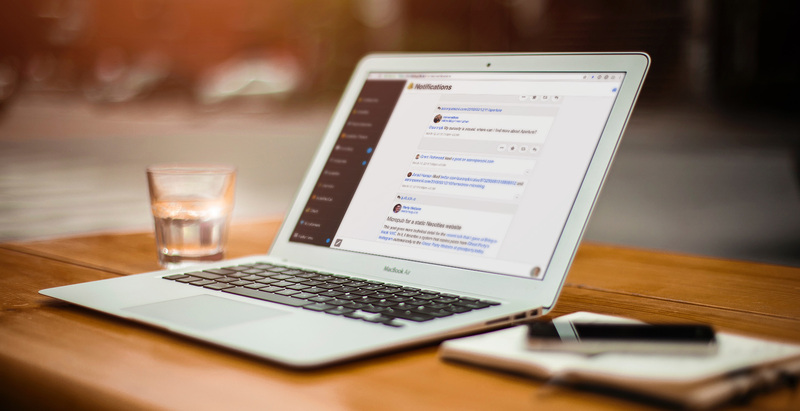 RSS readers have failed to adapt to the changes in how we create and consume content online. They are largely stuck in the blogging era, being used to consume blogs and news sites. If we want to have any hope of the open web and independent websites replacing our own use of Twitter and Facebook, we need to be able to have experiences at least as good as we have on those services. 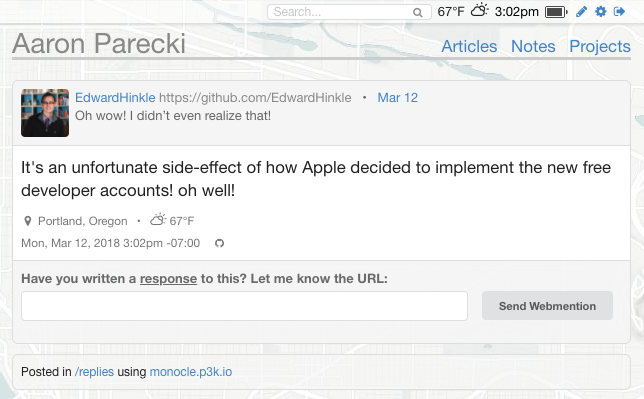 What if you could reply to a blog post in your feed reader, and your reply would show up as a comment on the original post automatically? What if you could click a “heart” in your reader, and the author of the post would see it? 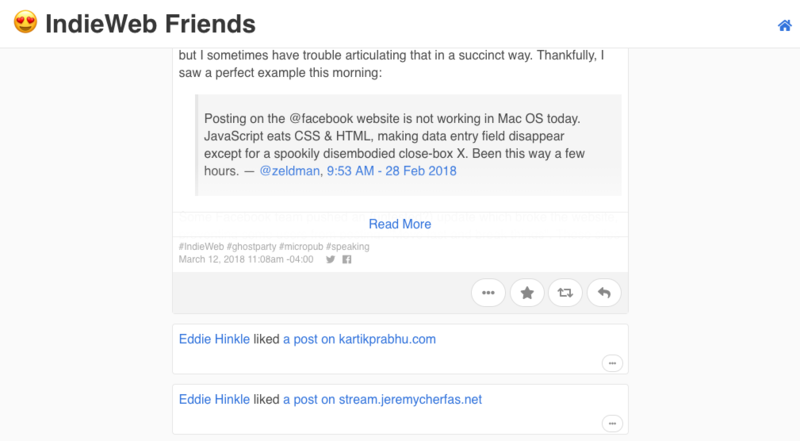 What if you had one place to go to follow not just your Twitter friends, but also all of your friends’ blogs, their microblogs, and see the pictures they’re sharing? 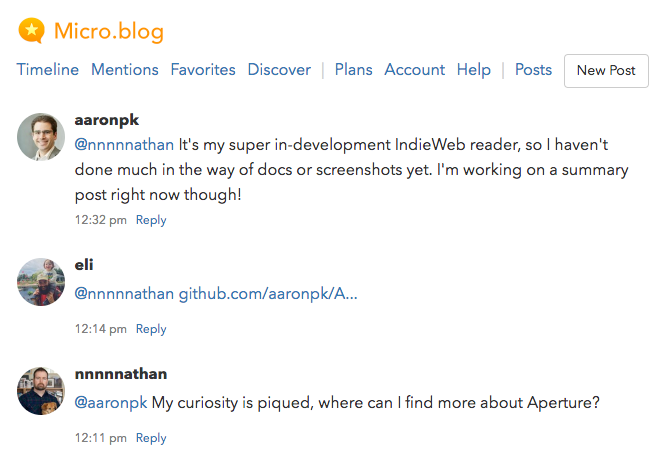 What if you could have seamless conversations in your reader the way you have seamless conversations on Twitter today? These are the things myself and the IndieWeb community have been making huge progress on in recent years. My IndieWeb reader looks kind of like a combination of an RSS reader and a Twitter feed. An important difference between this and a traditional RSS reader is that this interface has buttons I can click to reply to posts! 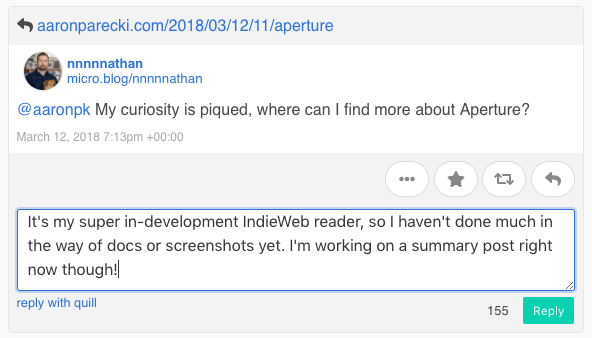 When I click Reply, the IndieWeb reader creates a post on my website, and notifies the person I’m replying to so their site can show it as a comment. I’m pretty happy with how my current IndieWeb reader is working right now! I’ve built it as a thin interface on top of a server-side API that handles all the feed fetching. In fact, there are alternative front-ends that work with the same server. When I’m on my phone, I can use a native iPhone app to see all the same content that I see on my computer. This separation between the reader interface and the server is critical to developing a new generation of readers. This is what lets us have the choice of using multiple different reader apps, all accessing the same data behind the scenes. This separation is documented in a spec called Microsub. The server side of the reader is software selected by the user. This might be built into their website CMS, or could be a separate service they sign up for. Typically, the server side won’t have much in the way of a user interface, likely just enough interface to subscribe to some feeds, but it doesn’t need to be able to display any of the content itself. Reader apps can then be built without needing to spend any time dealing with parsing different feed formats or worrying about having enough resources to poll all the feeds people are subscribed to. The reader apps become simple clients talking to the user’s feed fetching server. Check out my post, Building an IndieWeb Reader, for more details on how all the pieces fit together. 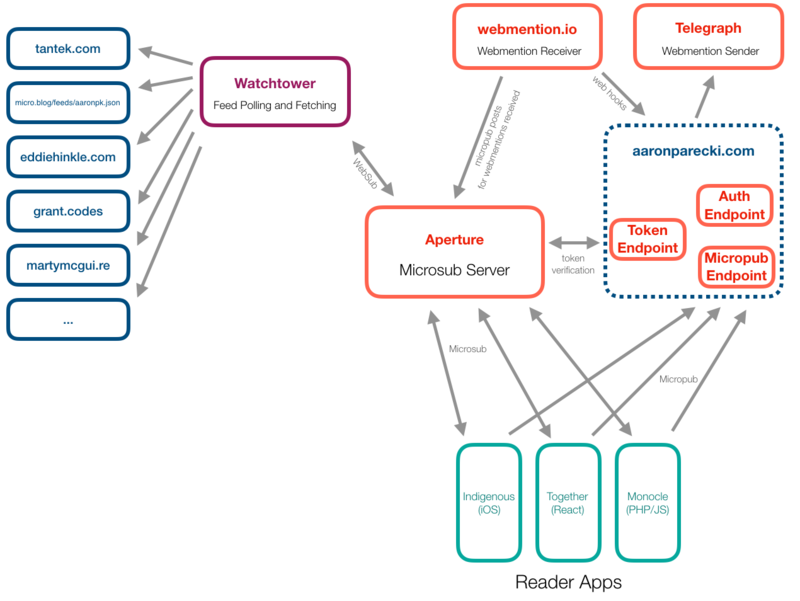 If you’re building a reader, check out the Microsub spec to learn how you can participate in this growing ecosystem. This part of the IndieWeb ecosystem is still in the early stages. I would love to see more development of both the reader apps and also the backend servers! If you use a CMS, consider installing or writing a plugin to add support for Webmention, Microsub and Micropub. If you’re an app developer, this would be a great time to build new Micropub apps to help people post to their websites, or build new Microsub apps with interesting and unique interfaces. Another fun challenge I’m looking forward to tackling soon is the ability to post and follow private content using our websites. The OAuth 2.0 extension IndieAuth provides us a solid base to work from. As always, I’m happy to chat about any and all of this. It’s been a lot of fun already to build this all out and see it working! 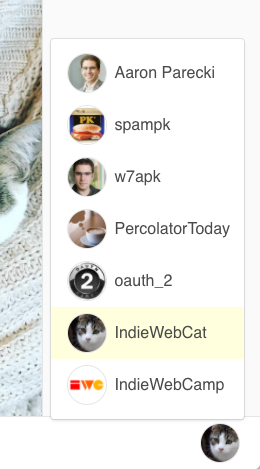 You can find me in the IndieWeb chat via IRC and Slack. This June, we’re hosting the annual IndieWeb Summit in Portland. IndieWeb Summit is for independent web creators of all kinds — from graphic artists to designers, UX engineers, coders and hackers — and is where we brainstorm and create lots of things like the IndieWeb reader. Head over to 2018.indieweb.org for more information and to register! hosting Homebrew Website Club SF tonight @MozSF! Special guest @aaronpk will demo his #IndieWeb reader setup! I'm thinking about using a new Microsub property in the entry to indicate the response URLs that may exist for this post. For replies, I'm not sure what we actually want the client to indicate. Long-term it would be great if the client had the ability to show the full conversation thread, so in that sense it makes sense to handle replies differently from likes and reposts. Maybe we can handle this question separately for replies. In the case of likes and reposts, we only care about the URLs of the user's own like/repost posts. Showing other people who have liked or reposted a post is a different problem, since that does not affect the state of the action buttons. In thinking through this, I'm leaning towards the second JSON option above, nesting the data under _actions, since this data is limited in scope to help indicate the state of the action buttons. It is not meant to cover displaying all responses to a post. 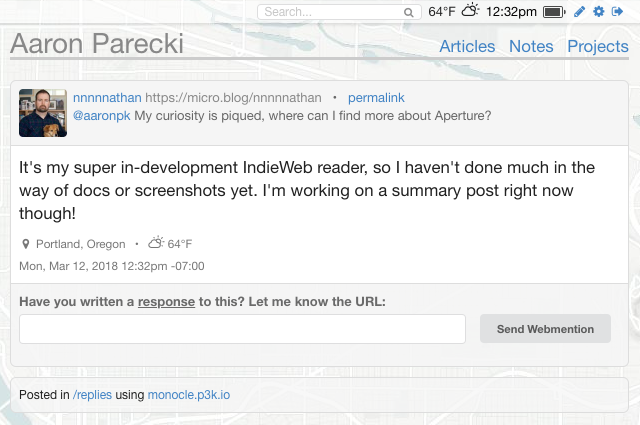 This has been implemented in Aperture, Monocle, Together, and Indigenous, and documented at https://indieweb.org/Microsub-spec#Mark_Entries_Read so I'm going to close this issue. 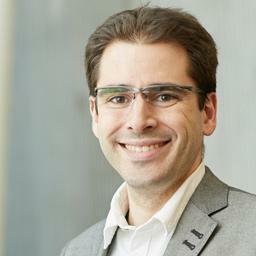 Let's open new issues for any future discussion about the specific behaviors within read-state tracking. Over the last several months, I've been slowly putting the pieces in place to be able to build a solid indieweb reader. Today, I feel like I finally have enough in place to consider this functional enough that I am now using it every day! 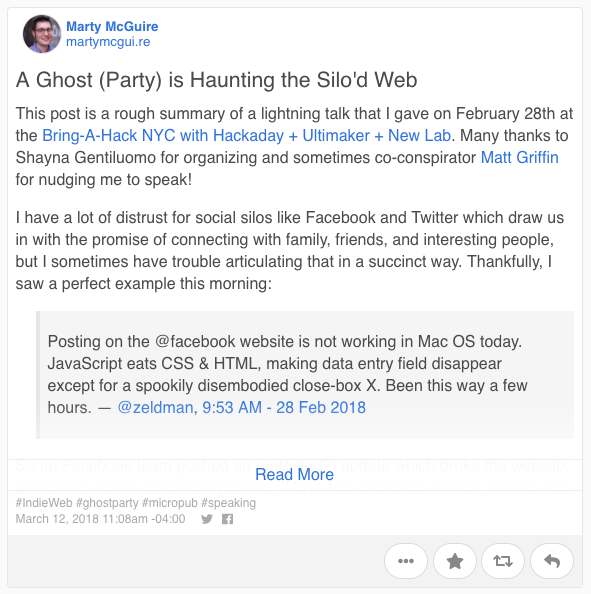 One of the major missing pieces of the IndieWeb ecosystem has been having an integrated reading and posting experience that mirrors the ease with which it's possible to post and follow on Twitter and other silo apps. 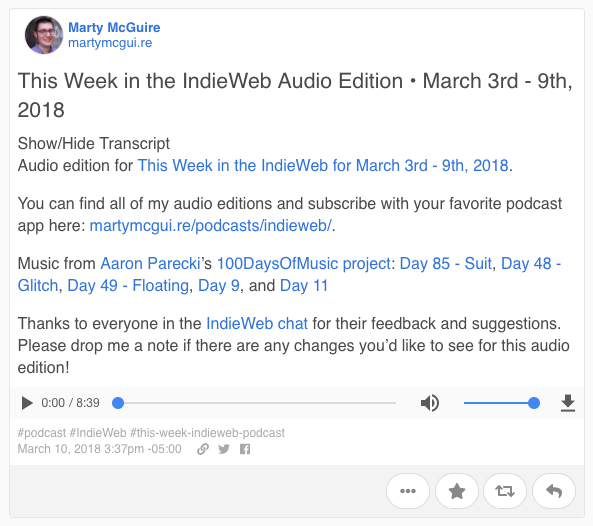 We've seen a few attempts at indieweb readers over the past few years, but nothing has really taken off or stuck around. Even my own attempts at readers have fallen apart, both the previous iteration of Monocle in 2016, and my fork of selfoss in 2014. My suspicion has always been that we haven't seen many people building out this part of the ecosystem because it turns out there are a whole bunch of different parts to building a reader, many of which have no overlap in skillset: managing the subscription list, polling and fetching feeds, parsing feeds, data storage, rendering posts in a UI, providing inline action buttons to be able to reply and favorite posts, etc. In April 2017, I started outlining a spec that draws a hard line between these very different parts of building a reader, and called it Microsub (for subscribing), as a complement to Micropub (for publishing). The basic idea is to separate the feed subscriptions from the UI parts of building a reader. I started working from the ground up on building out the various aspects I knew I would need in order to eventually end up with a fully functional reader. I based a lot of these design decisions around my previous experience in building a reader, as well as my documentation of how I use IRC to read content across the web. My goal with this is to use this as my primary online dashboard to follow all kinds of content, as well as being able to interact with the content without leaving the interface. The main organization of the reader is laid out in "channels". You can also think of these as "folders" if you want. 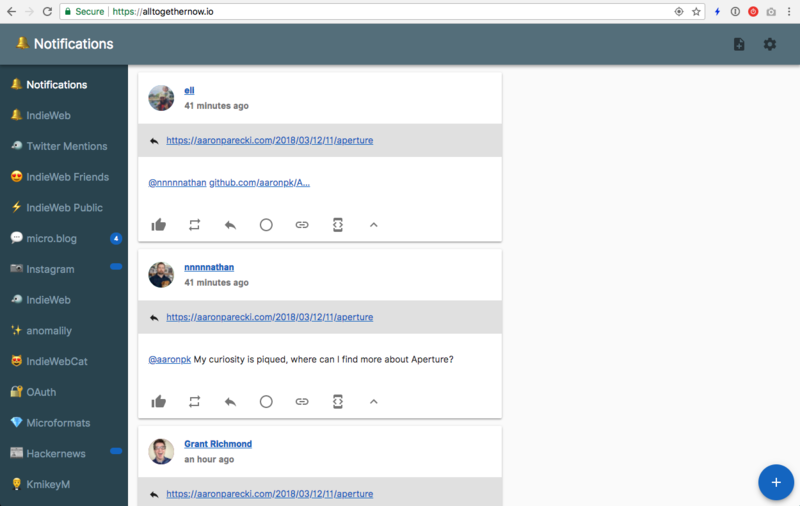 Many feeds (or sources) can be added to a channel, and the posts are all combined into a single timeline view. Monocle supports displaying a few different types of content in posts. It has native support for notes, articles, photos, multi-photos, videos, audio clips, checkins, favorites, reposts, and replies. Since I follow my Instagram feed in the reader, I wanted to have a good display for photos, especially when there are many photos attached to a single post. I ended up doing a simple custom layout when there are two or three photos. Four or more they just start tiling as half-size photos. With three photos, the first photo appears larger on the left and the other two are stacked to the right. I wanted to be able to read full articles in the reader without jumping out to the site, but also didn't want to have to scroll endlessly when I'm just skimming headlines. So if an article has content that is too tall, it gets truncated with a "read more" link to expand it. If the post has an audio file, such as podcasts, then there is a simple HTML audio player inline! Each post has a set of buttons to be able to respond to the post. 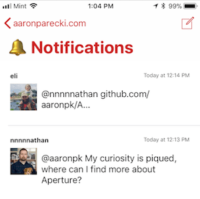 The quickly accessible actions are "favorite", "repost", and "reply". The three dots opens up an expanded menu with some additional options, some of which I have not yet implemented. Currently it's possible to remove a post from a channel, and to open up a debug view showing the raw data behind the post. Eventually this will expand to include muting the author, blocking the author, or unfollowing the source the post came from. Clicking the "reply" button drops down a little text box for posting a reply. There is a character counter just so that I have a sense of how long the post is. Since this is posting the reply back to my website, this interface has no idea what sort of character limits there are, so it's just a simple counter. When I click the "Reply" button, the app makes a Micropub post to my website to create the post there. My website already has all the logic for adding that to my replies feed and sending webmentions to the post I'm replying to. Since this post I replied to is on Micro.blog, and Micro.blog accepts webmentions, the post showed up there within a few seconds. The same workflow happens for favoriting and reposting things. My website also recognizes when the post I'm replying to is a Twitter or GitHub permalink, and will automatically syndicate my reply or favorite appropriately! 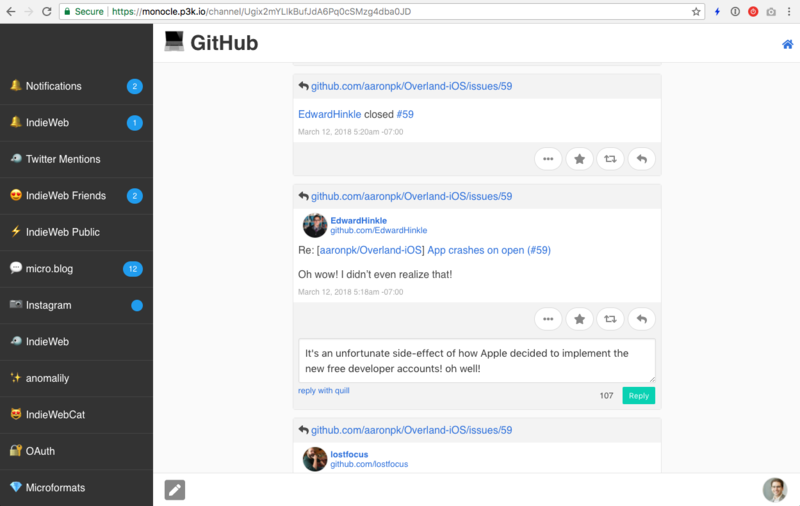 Since I added my GitHub notifications to a channel, I can actually reply to GitHub issues directly from the interface! You may have noticed the little blue dots next to the channel names in some previous screenshots. Those indicate how many unread posts are in the channel. However, some feeds that I follow end up with tons of posts in the channels, so many that the actual number of posts is no longer significant! All I really want to know is whether there is something new or not. To account for this, I can choose whether a channel implements per-item tracking, or just a boolean read/unread indicator, or disables read tracking altogether. When I'm looking at a timeline, any new posts appear with a yellow glow around them. As the post scrolls out of view, it gets marked as read, and that state is pushed to the server so that other clients will also know it's now read. I really enjoy not having to manually mark things as read, instead the interface just handles it all for me without any additional interaction. Since I actually have several different websites I use, I wanted the response buttons to be able to post not just to my website, but also to the other websites I have. For example, my cat Dora, who has her own website is not always the best at using the computer, so sometimes I have to favorite things for her. I can choose a alternate default account per channel so that the response buttons will actually post to the alternate website. Notice Dora's cat face in the bottom right corner of the screen. This lets me know that interacting with posts in this channel will be posted to this alternate account. I can even temporarily switch to a different account by clicking on the profile icon and choosing another account. You may also have noticed the little pen icon in the lower left corner. Clicking that pops up a dialog for writing a new post from the selected account. I chose to keep this interface super simple, providing just a text box and character counter. 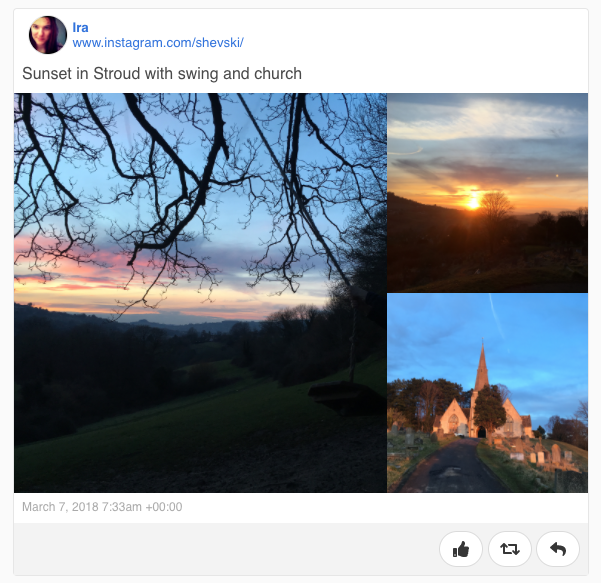 If I need to write something more complicated, such as including HTML content, adding a photo, or choosing where the post is syndicated, then I'll just pop over to Quill and write the post there instead. I mentioned earlier that there were many parts to this, and I haven't talked much about that yet. The most important thing about the architecture of this system is that it is not just a single monolithic app. Instead, there is a server responsible for collecting all the data from the feeds I'm following, and separate apps for displaying them! Since I was documenting everything on the wiki as I was building this out, other people were able to jump in and start writing clients from the beginning! There are already two other great interfaces that work with the same backend server! Here is the same content rendered by the iOS app, Indigenous, written by Eddie. I'm pretty thrilled that already we've been able to have two people jump in and build readers so quickly already, thanks to the hard work of feed fetching being abstracted away by the server! Now to start getting into the technical bits of how this works. Feel free to skip this section if specs make your eyes glaze over. I mentioned before that the main separation going on here is splitting off the feed fetching and parsing from rendering the posts. The main idea behind this is the Microsub spec. This is the spec that the Microsub server implements so that clients know how they can talk to it. Ideally there will eventually be a large ecosystem around the spec, with many clients to choose from, and many servers as well. We'll see some projects build in Microsub support natively, so that they work out of the box, and we'll also see some dedicated feed subscription services support Microsub. The nice thing about using your website identity to tie the pieces together is that you can choose your Microsub server separately from choosing the software that powers your website. For example, I decided early on when building my website that I didn't want to mix the idea of following feeds into the same software that powers my website. So instead, I wrote an external Microsub server called Aperture, which is responsible for all the feed polling and parsing and storing the posts in channels. Aperture is open source, although I still consider it "in active development", so I am not officially supporting it right now. You are of course welcome to get it running yourself, but be prepared for things to change quickly. If you want to try to get Aperture and Watchtower running, Daniel did a pretty great writeup of his experience getting things set up in two posts: Part 1 and Part 2. Ideally I would love to see some more implementations of Microsub servers, so head over to the spec if that's your thing! Monocle is the Microsub client I wrote that's featured in the screenshots above. It is also open source. Since it doesn't do any feed parsing itself, it doesn't even have a storage backend! Everything is fetched on the fly with the exception of the channel list and Micropub config which is persisted in the session data. When I click on a channel to view it, Monocle first makes a Microsub timeline request to Aperture to fetch the channel data, then renders it in the timeline view. This is analogous to the iOS app Indigenous fetching the timeline data from the Microsub server then rendering it on the phone, except Monocle is doing that server-side to generate HTML for the browser. You might think I'm crazy for having written a PHP app that fetches JSON from an API and then renders --gasp-- static HTML in 2018, but guess what -- it's fast! Monocle is open source, but I am also hosting a version online that anyone is welcome to use at monocle.p3k.io. Since it doesn't actually store anything itself, I don't expect it to take up any significant resources any time soon! Of course in order to use it, you'll need to have your website pointing to a Microsub server of your choosing. Since that's where all the actual work is done, I am not making my hosted version of Aperture available for general signups right now. You'll need to either get that running on your own server, or build a Microsub server from scratch! This last section has been a bit of a wall of text, so here is a diagram showing how all the pieces fit together to make this possible! My website contains the IndieAuth and Micropub bits, but others have chosen to use external services for those as well. 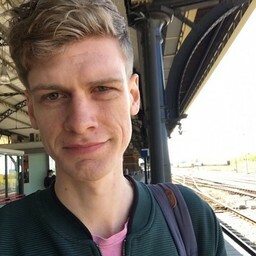 I've also chosen to outsource sending and receiving webmentions to external services, whereas other people end up handling those within their own website code as well. The reader apps all talk to the Microsub server that I've linked to in order to view posts, and when I tap a "like" button or write a reply from the app, they post that to my Micropub server to create a new post. I use webmention.io to handle my incoming webmentions, and it is configured to send posts to a channel in Aperture using Aperture's Micropub API. This has been a very long read, so congrats if you've made it this far! Here are some links if you're curious about how you can start building out various pieces of the ecosystem as well! While this is all a good start, and I do actually use this as my primary online home now, there is still a lot more work to do! More Microsub servers! I want to see at least two more solid Microsub server implementations in the relatively near future! That will help develop the spec further and ensure we're actually building interoperable tools. I suspect one of the implementations will end up being part of an integrated CMS such as Known or Wordpress, or will be a proxy to an existing feed reader service. Following private content. Private content has always been a challenge, mainly due to the fact that any time authentication is involved it complicates things a lot. With IndieAuth finally written up as a spec, we now have a solid building block to use to experiment in this area more. An Android Microsub app. While both Monocle and Together work pretty well on mobile browsers, there are still many advantages to having a native Android app! And it sounds like one is already in the works. Better UI for actually following people. I've kind of taken a shortcut on this front in order to move the rest forward. 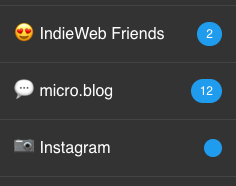 Right now, you still need to type someone's URL into a Microsub app in order to follow them. There are many challenges with streamlining this process further. As always, I'm happy to chat about any and all of this! It's been a lot of fun already to build this all out and see it working! 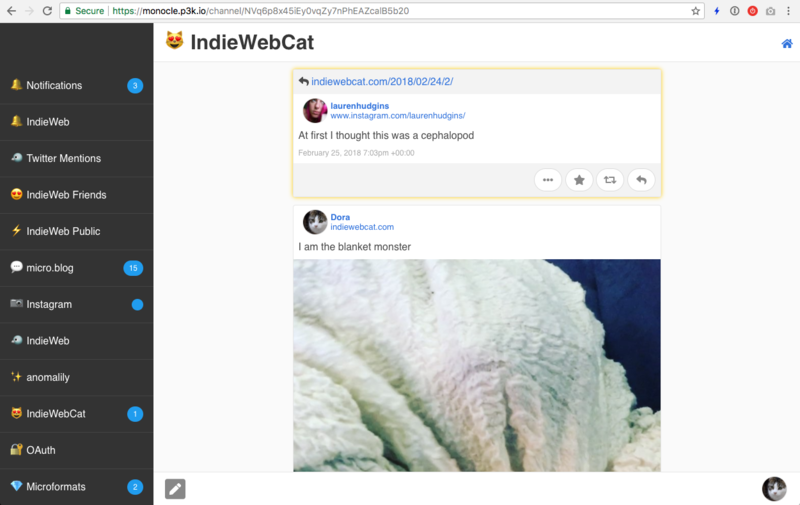 You can find me in the IndieWeb chat via IRC and Slack, if you send me a Webmention I'll see it in my reader, or find me at an upcoming IndieWeb event! Just made Aperture download a cached copy of avatars and other media it finds in posts! Now the images will always be available over https, and images from old posts won't disappear! If you're running your own copy of Aperture, it'll take an extra step of setting up a subdomain to serve the images from the storage folder. They're not served from the main domain for security reasons. Monocle just got real fancy. I can now set a default account for each channel from which responses should be sent. (Stored in my Microsub server, not in Monocle, so it can work across clients). Monocle recognizes when alternate accounts are available and provides an account switcher UI in the footer. Any "like/repost/reply" actions are then sent via that account instead of to my main site! 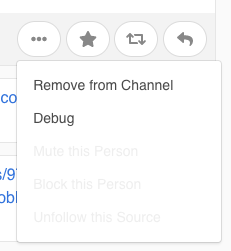 Users may want to remove an entry from a channel for various reasons. Since #4 tracking read state means we now have referenceable entry IDs, we can use those to also remove entries from a channel. My main question is whether the url should be the home page URL of the feed or the actual feed URL. I'm almost thinking we need to be able to include both. If you're following an Atom/RSS/JSONfeed, then the feed URL is not something you'd want to send a user to, so you'd want the "home page" URL instead. For HTML feeds, it would be fine to use the feed URL directly. However from a security perspective, if the entry's URL is on a different domain than the URL the entry was found on, the UI may want to indicate this in some way, similar to how my webmentions display the source URL as "via ____" if the source URL domain is different from the entry's reported URL. The main case this might happen is an aggregator where the every item in the feed is from a different domain than the aggregator's feed. Also micro.blog feeds where the post's original URL is reported instead of the micro.blog URL. So I'm thinking we might need two properties, feed URL and home page URL. Unfortunately this no longer maps well to h-card. Any ideas? Monocle+Aperture are coming along nicely! I just got my GitHub notifications piped into the reader, which is a much nicer experience than reading them via email or trying to track them down on github.com! I have a few channels set to show just an indicator dot when there are new posts rather than showing the number of new posts, a much calmer experience. Unread posts show up with a faint yellow glow around them, and they're automatically marked as read when they scroll off the screen. At this point, I've actually moved all of the feeds I was previously following from IRC into Aperture as a way to force myself to continue putting the finishing touches on it! I pushed an update to Aperture which allows you to toggle per-channel whether read state tracking is enabled. There are two modes, one where it returns the count of the number of unread items, and the other where it returns only true or false depending on whether there are new items. For my super busy feeds, it wasn't useful having the counts, but I do like a subtle indicator there are new posts. There are also some channels I don't want to be bothered about at all, so I've disabled read state tracking on those. Can you provide examples of what you're finding that is not normalized? Microsub is not "merely delivering the content from other locations". Microsub is in fact specifically already doing a lot of normalization of the content it finds, producing a feed that is much more standardized than what it discovered when crawling the feeds, even to the point of making vocabulary-specific decisions about some values.